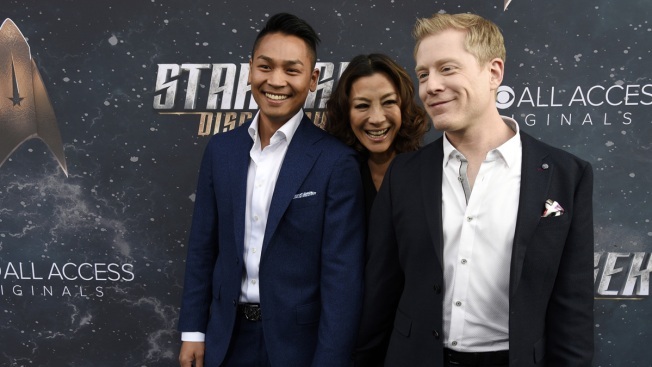 In this Sept. 19, 2017 file photo, Anthony Rapp, right, a cast member in "Star Trek: Discovery," poses with his boyfriend Teerakeni and fellow cast member Michelle Yeoh at the premiere of the new television series in Los Angeles. The original "Star Trek" was born into a world of hurt. The United States was embroiled in a war that wouldn't end. The president was increasingly embattled. Americans were polarized. Now, a half-century later, "Star Trek: Discovery" lands in a nation that seems no less burdened, while the new show's mission is unchanged from the series that spawned it: to enter the future with hope and face the present with courage. It is an upbeat tone as much as a taste for adventure that has propelled the "Star Trek" franchise through so many TV and film iterations. Now comes the eagerly awaited "Star Trek: Discovery," which premieres on CBS on Sunday at 8:30 p.m. Eastern. After the broadcast premiere, the series launches Sunday night on the CBS All Access subscription streaming channel, the exclusive home for the rest of the series. "Even though this first season is set against the backdrop of a Klingon-Federation conflict, it's really about finding the Starfleet way to get OUT of the conflict," says Gretchen J. Berg, an executive producer and co-showrunner with Aaron Harberts. "How do you end the war and still maintain the ideals the Starfleet confederacy is all about? To that end, there will be hope, there will be optimism, there will be people trying to be the best version of themselves, which is something I think we really need to be focused on in this day and age." Real-life current events on planet Earth "create a lot of story for us," she acknowledges, "and through our storytelling we're trying to help figure out a pathway to a brighter tomorrow. Talk about making lemonade out of some very bitter lemons!" The new series, which begins a few years before the 23rd century time frame of the original Captain Kirk-led "Star Trek," boasts a large cast including Jason Isaacs, James Frain and Rainn Wilson, as well as fan-favorite Sonequa Martin-Green, late of "The Walking Dead" and now the first black woman in command of a "Star Trek" starship. Always on the vanguard in promoting diversity and tolerance, "Star Trek" takes another step forward on "Discovery" by including in its crew an openly gay character played by an openly gay actor, Anthony Rapp. Lt. Paul Stamets is an astromicologist (studying mushrooms and other fungi in outer space). With his scientific bent and sky-high IQ, he can be a little prickly, Rapp says, which only adds to the fun of playing him. The 45-year-old Rapp, who landed his first professional job at age 9, won fame 20 years ago for originating the role of Mark Cohen in the Broadway hit musical "Rent," a role he reprised in the 2005 film. He also played Charlie Brown in the 1999 Broadway revival of "You're a Good Man, Charlie Brown," and originated the role of Lucas in the musical "If/Then" in 2014. "I've always been a nerd and fan of 'Star Trek' and all sorts of science fiction," he says, "but I never conceived of myself as being inside of it as an actor. 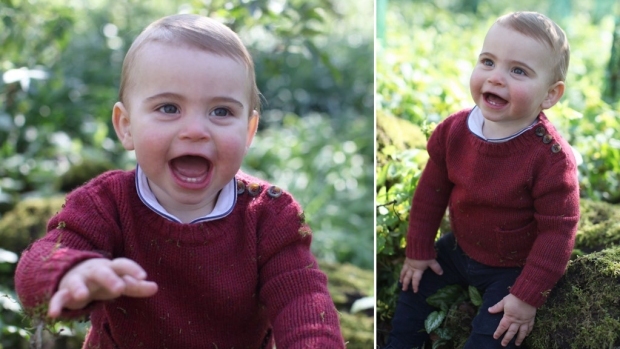 This is like a childhood fantasy gone wild, actually doing it in real life." On his first day at the vast Toronto soundstage, Rapp says he found himself on-set "walking through these corridors in my Starfleet uniform with my badge— like I'm in space! It's really, really thrilling." Devout Trekkers have been less than thrilled that the new series, announced in late 2015 and promised a bit more than a year later, has been repeatedly postponed thanks to unforeseen complexities of production and casting. "I can totally understand that it can be frustrating and mysterious to people who aren't inside the process," says Rapp. "But I can assure you the delays have resulted in something that is incredibly well-conceived and brought to life." For the first time, this "Star Trek" will be serialized, with its narrative flowing from the premiere through episode 15, which concludes its second season. "It's about culture clash," Rapp says. "I think that's a theme that's pretty relevant these days. But 'Star Trek' has always been grounded in philosophical and ethical questions, exploring what it means to be human and what do you do when you encounter another culture." It's the sort of positive message Rapp has always sought to put forward, as both an actor and a human. It prompted him to come out a quarter-century ago. "Visibility matters," he explains. "It's so easy to denigrate or ignore someone you don't see and you feel different from. If there was any chance that whatever visibility I have could make a difference, I'd want to be on the right side of that." Then Rapp reaches for his phone to share a message he had gotten minutes earlier, en route to this interview, which in three short sentences maybe says it all: "I'm Muslim but that doesn't mean I have a problem with you being gay," it reads. "In fact, you've helped me open my mind up. And I love science fiction and I love 'Star Trek' and I can't wait to see the show."